One Way Restaurant specializes in everything sourdough from bread and burgers and even pizzas. It gets its name from the restaurant’s location, they are located at the junction of two one way streets, Salcedo and Benzvidez in LegaspiVillage in Makati. The restaurant is owned by Joseph Assad (consul of Lebanon) and his friends Louie Ysmael, Dave Vaughn, Ralph Joseph, and Nando Ortigas. You can read more about the story behind the restaurant here. Street parking is pretty easy at night but if by chance it is full then they have plenty of spaces in the back of the building, you just need to circle around. 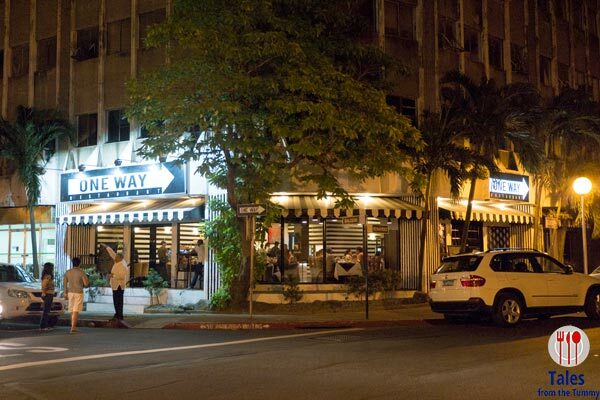 The One Way Restaurant sign facing Salcedo Street is the biggest one way sign in the Philippines, measuring a length of 18 feet. Consul Joseph Assad invited a couple of us to try out their place for dinner a couple of weeks ago. The place is decked out in black and white, inspired by the ubiquitous one way sign right outside their doors. Plush seating and chic decor project a notion of the expensive but a quick perusal of the menu will quickly dismiss that notion. Our dinner fittingly started with some multi-grain sourdough bread, which they also sell via the small attached bakery. Nice crusty bread with a delicious chewy center. Next to arrive was a Mediterranean platter made up of Hummus, Baba Ghanoush and Tabbouleh with some pita and sourdough bread. 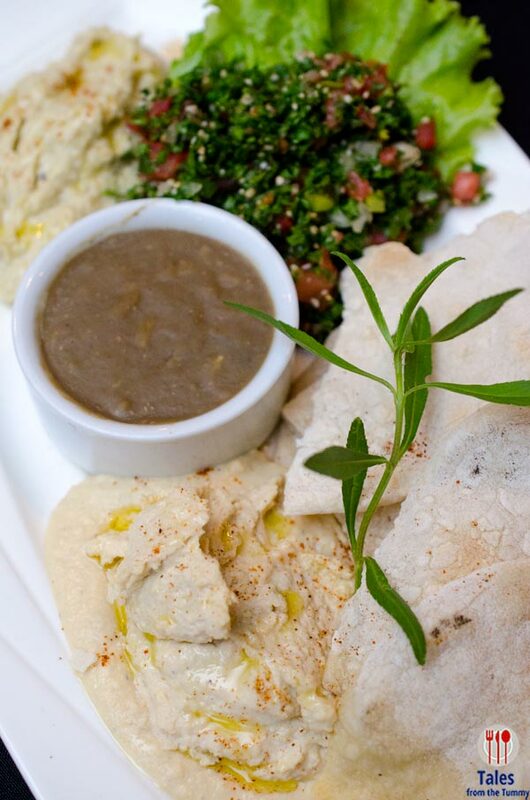 I enjoyed the baba ghanoush wihich I smeared on the pita topped with some tabbouleh, a Lebanese salad. I skipped the hummus because I’m not really a fan of chickpeas but our dining companion said it was one of the best she’s had locally. We also got to try the healthy looking Mint, Lemon and Herb Shake (P80). I was actually hesitant to try it since it was all green except for the slice of lemon. I took a small sip and surprisingly enjoyed the refreshing and minty taste. 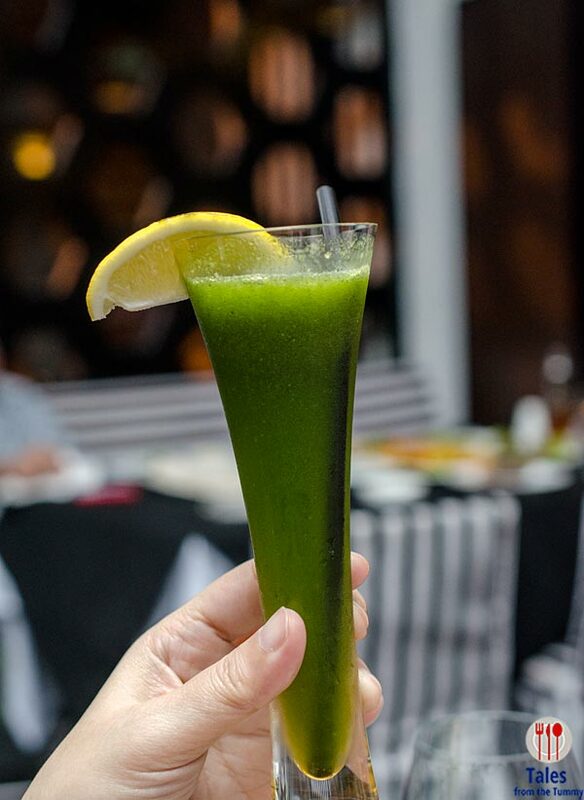 It’s a nice and healthy way to clear your palate. 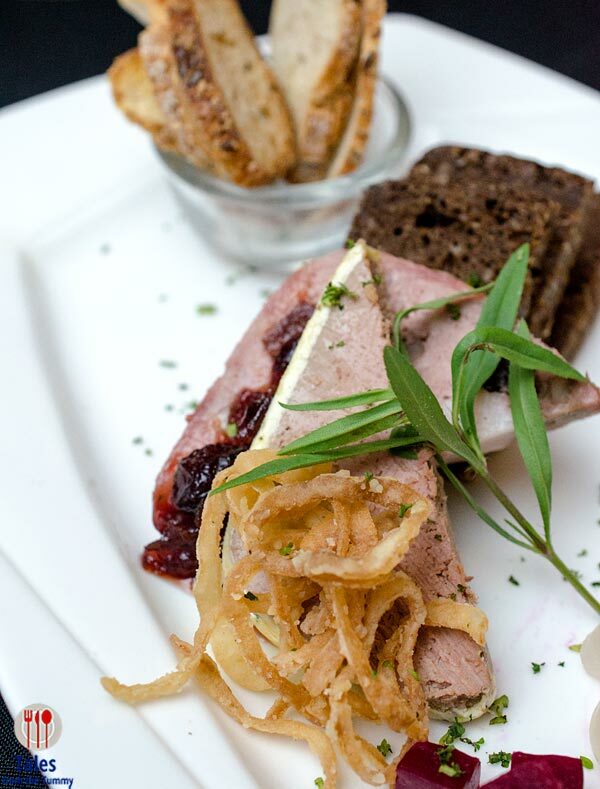 The Chef’s Pate Platter is made up of chicken liver pate and pork terrine served with cranberry jam, pumpernickel bread and sourdough bread. 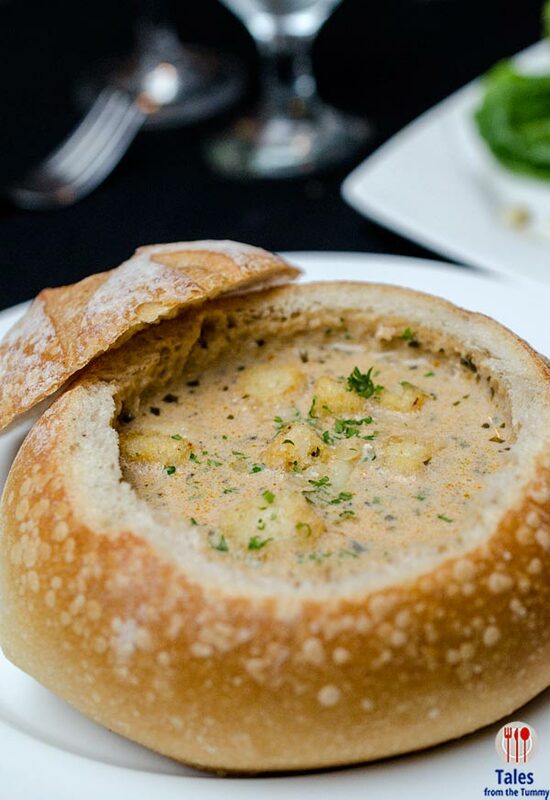 Warm up your stomachs with their soups, all served in a sourdough bread bowl. 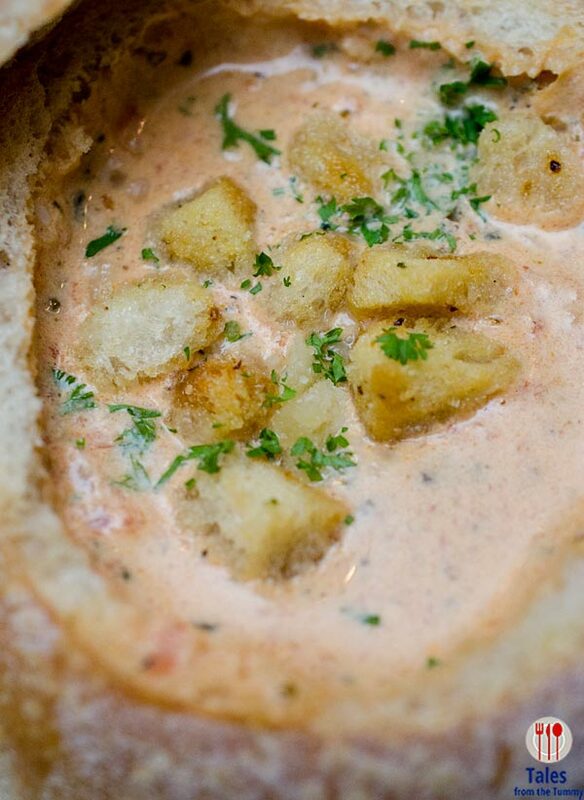 Irene picked the Cream of Wild Mushroom Soup (P150) which she really enjoyed with a nice creamy and chunky texture. This can actually serve as a meal in itself if you eat all the bread. I got the Cream of Tomato Soup (P130) so we could try different things. While I enjoyed this one, I felt the mushroom soup was a cut above it. After the soups, it was time for their Sourdough pizzas, created with consultant Jackie Chan (not the actor), a baking hobbyist for the last 15 years. 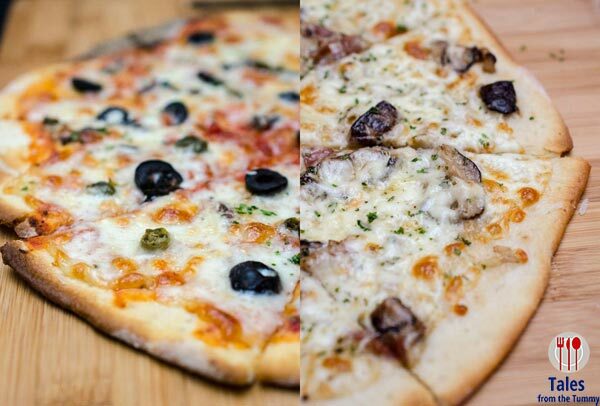 The pizza on the right is the Napoli (P340), which has anchovies, capers and olives. The one on the right is Carbonara (P470), with bacon, cream and mushrooms. The pizzas are more on the thin side of things but capable of carrying all the toppings, no folding in half while holding a slice. There’s a nice crunch that yields to a chewy and flavorful dough. The Napoli was my favorite of the four served to us because of the anchovies in it but I also quite enjoyed the Carbonara, think of it as the pasta in pizza form. 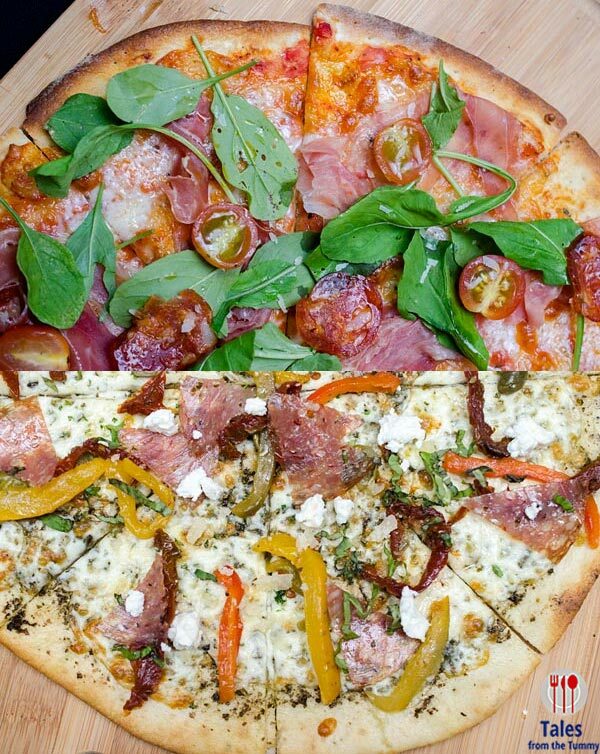 The one on top is the Pamplona (P470), a meaty pizza with Jamon Serrano, spicy chorizo, arugula and cherry tomatoes. This was Irene’s favorite by virtue of the presence of jamon serano, her favorite cured meat. The pizza on the bottom is the Mediterranean (P560) which comes topped with Goat cheese, sun dried tomatoes, capsicum, capers and salami. I felt the Mediterranean had too many toppings and did not really mes. If you don’t like any of their pre-made pizzas, you can opt for the Make your own Sourdough Pizza (P680/12 inches). The last thing we sampled was the Classic American Burger (P420). A quarter pound cheeseburger with a sourdough bun with mushrooms and strips of bacon. 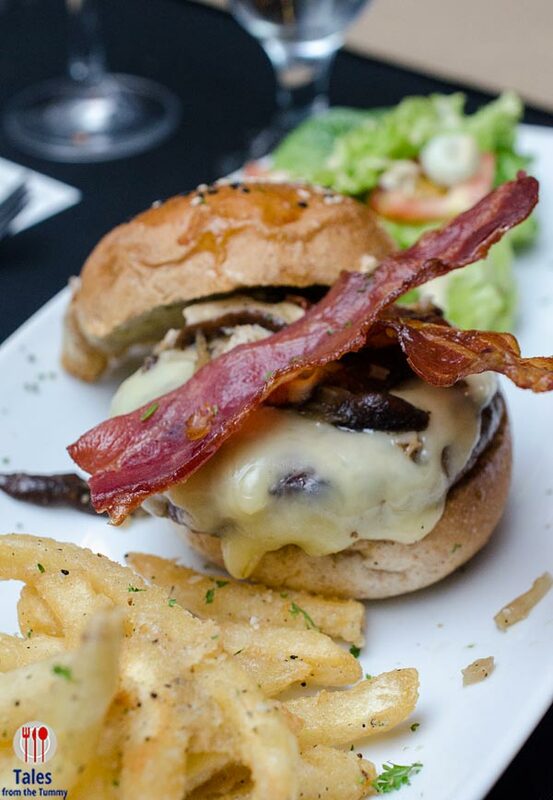 It is served with some of the best fries around, trust me they are addictingly good. 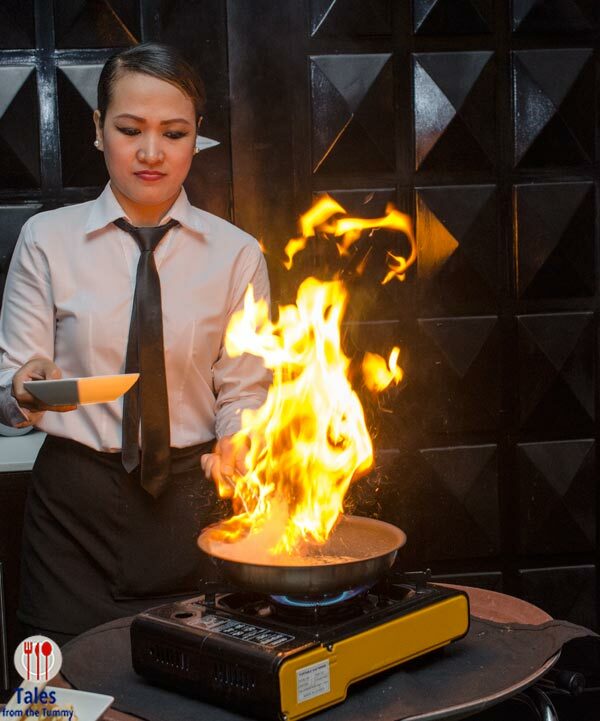 For dessert, be prepared for a show as they do their signature crepes table-side complete with the flames. 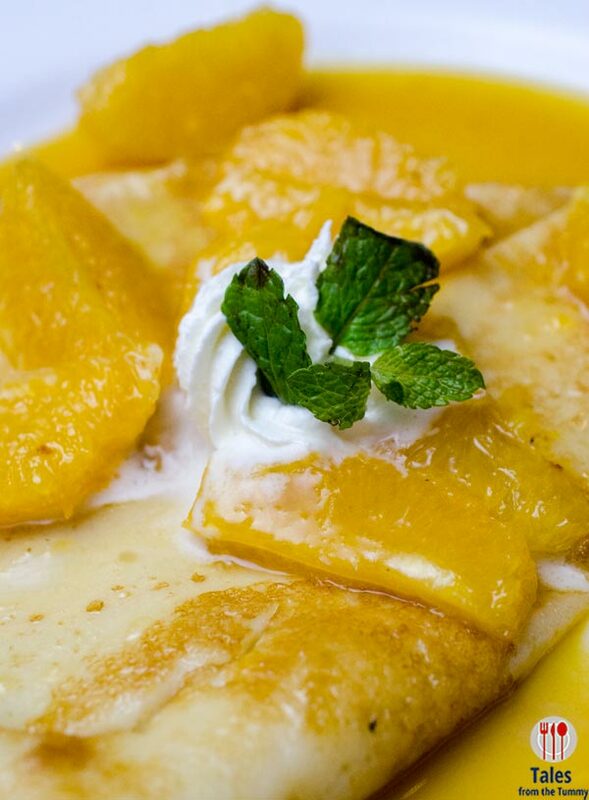 My pick was the Crepese Suzette (P180), made up of orange and Gran Marinier has a perfect balance of sweet and tangy flavors. The Mango Jubilee is a classic you can’ go wrong with while I felt the Limone was way too tart. One Way Restaurant serves some of the best sourdough bread around and this is what keeps diners coming back for more. Aside from their sourdough creations, they also serve steaks and pasta. 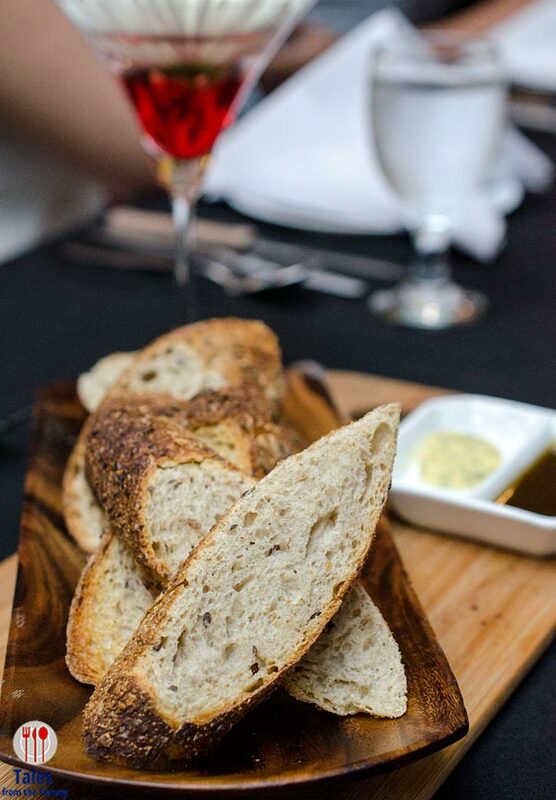 If you love sourdough bread then a meal at One Way Restaurant is a must. 206 Salcedo cor. Benavidez St.
Lucky shot on that flame, good thing they made 3 crepes, so I had three chances. Be sure to get one of their soups, if you drop by One Way. Love mushroom soup in sourdough bread! you should definitely try One Way’s version of it.